We are Volodymyr Muliar and Yaryna Kvitka – travellers and musicians from Ukraine. On the road we are known as members of a "Two-wheeled Chronicles" project and on the stage we are Folknery. In October 2014, we set off on a cycling trip around the world within the “Two-wheeled Chronicles” project. As we travel we record folk music from the peoples of the world, play it with the local musicians, maintain a videoblog, write articles, tell people about Ukraine and sing our songs to them. And we are also making a movie! We started in Kyiv, Ukraine, travelled 25,000 km and visited 13 countries on our way to Sydney, Australia. That was the first stage of our expedition. In Sydney, we had a baby son – Marko. When he was one year old, three of us rode our bikes through 4 countries of Asia. And we still need to cover the other half of the globe. Marko is two years old now. He is a very healthy and active child. Together with Marko we are planning on finishing the second stage of our round-the-world trip and are actually on the road already. Europe, Africa and both Americas await. It will take us a year and a half to complete it. Daddy and mommy on bicycles and the baby in a buggy… We feel inspired and strong enough to make our dream come true. We would like to accomplish what most people think to be impossible. Not many Ukrainians get to travel, even fewer do so by bike, and almost no one travels by bike with children. We believe that everyone is a master of what is possible and feasible in their lives! 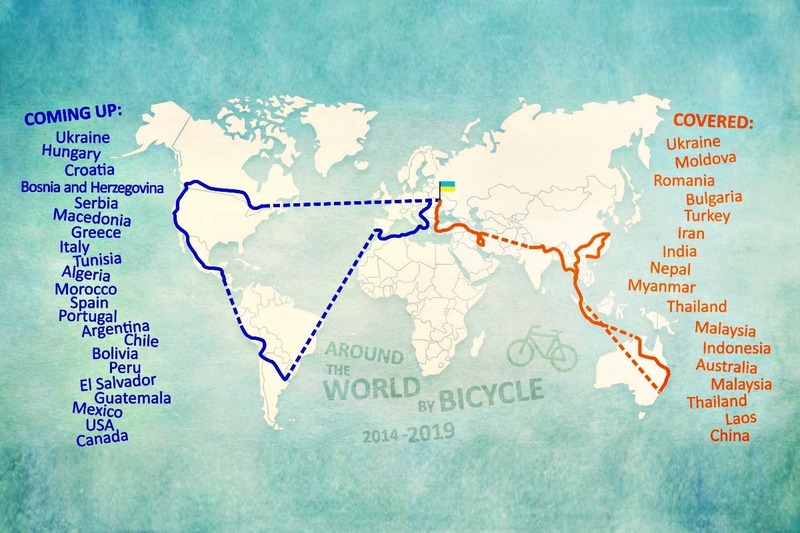 Since this is a round-the-world trip, we cannot avoid a few long distance flights with bicycles and other equipment (especially from Europe to South America and from North America to Europe). Also with Marko we will be forced to stay in hotels and hostels more (during the first stage of our expedition we only stayed in our tent or with people). We would also like to use some money to reward the people who help our project for free, and among other things translate everything into English. Our family will start the next stage of the journey in the middle of July 2018. The 25,000 km (over 15,000 miles) route will go through Europe, Africa, and both Americas, and will take us a year and a half to complete it. Just as before, we will continue to publish video episodes to our Youtube channel. And you can help us to get closer to the goal! Дякую за те, що ви робите! Класний у вас проект. Говоріть більше про те щоб вам допомагали.